Here at My Favourite Voucher Codes we are waiting for the sun to start shining, the weather to warm up and to dig out the picnic blanket. 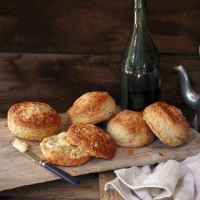 Our Waitrose, Asda and Argos discount vouchers are here to help you make the perfect picnic snack – cheese scones! Not only are they delicious (especially when you follow our recipe), but they’re also incredibly easy to make and will keep in an airtight container – ideal for lunchboxes as well as those aforementioned picnics. If you need to stock up on essential ingredients, we have a couple of great supermarket savings available right now in the form of a Waitrose discount voucher. You can use the former to claim a £20 discount on you first online shop when you spend £100 or more, but don’t worry if you’ve already shopped online with Waitrose before – we have other Waitrose codes that can save you money on subsequent orders. Our Asda discount code is in a similar vein, with £10 off your first shop when you spend £60 or more before 2nd May – perfect for those of you looking for excellent value on your ingredients. Heat your oven to 220 degrees centigrade/gas mark 7 and line a baking tray. Sift the flour, salt, baking powder, Cayenne pepper and mustard powder (if using) into a large bowl. Rub in the butter with your fingertips until you have a crumb-like consistency and then mix in 90g of the grated cheese. If using Dijon mustard, stir this into the milk then pour over the flour and butter mix. Combine using a round-ended knife or wooden spoon until you have a soft dough. Add more milk if necessary. Flour a surface and roll out your dough until its approximately 2cm thick. Cut out 5cm rounds, then repeat until you have used up all the dough (this should make about 12 scones). Place on the baking tray and top each one with a small amount of the remaining cheese. Bake for 10 minutes, or until golden. Leave to cool on a wire rack. These make excellent additions to any picnic – you can serve with butter, or as an accompaniment to dips and cold meats. Seeing as picnic season is almost upon us, we took a look at the latest Argos voucher codes to see what savings they have on picnic accessories. Let’s just say we weren’t disappointed! Not only can you use this Argos promotional code to claim a £5 voucher when you spend £50 or more, but they’ve also got price cuts on the Great British Summer Melamine Picnic Set (was £49.99, now £44.99) and the Trespass Deluxe 4 Person Picnic Pack (was £49.99, now £34.99) – all you could ever need for the perfect picnic outing.